Readers of this blog will know that being ever-so-slightly ‘outdoors averse’, I am making a real effort to love all things camping, and, er, outdoorsy. The Husband and kids, on the other hand, adore being outside and my days of demanding high thread count sheets and a minibar are looking increasingly numbered. I cannot claim to be quite ready to audition for the next series of Bear Gryll’s “Mission Survive” but for the sake of Caitlin and Ieuan, I am willing to at least contemplate a lifestyle that doesn’t necessarily include a hotel inspector. In preparation for this year’s sojourn into the great outdoors, we were given the opportunity to try the winner of “Best Family Product” in the Outdoor Industry Awards 2016 – the Vango Starwalker Junior Sleeping Bag. 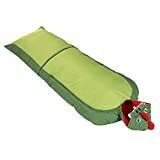 It’s really important to find good sleeping bags for children so that they feel comfortable and safe. The Vango Starwalker Junior is a versatile sleeping bag, which gives children freedom of movement with the option to zip off sections at the legs and shoulders. 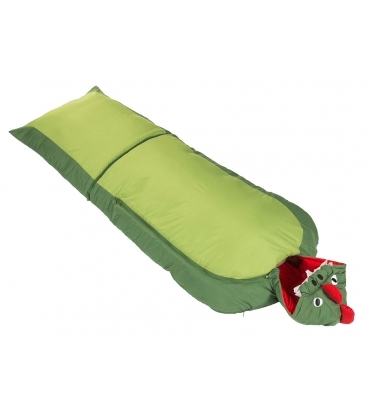 It comes in two designs, the dragon or the panda and, because the bottom zips off, the kids can easily run around the campsite in it to keep warm or, in Ieuan’s case just because he enjoys being a dragon. The Starwalker Junior is made from 210T microfibre polyester with single hole siliconised hollow fibre insulation to increase durability. It has a hood for additional warmth and a large front zipper so the kids can get easily in and out. 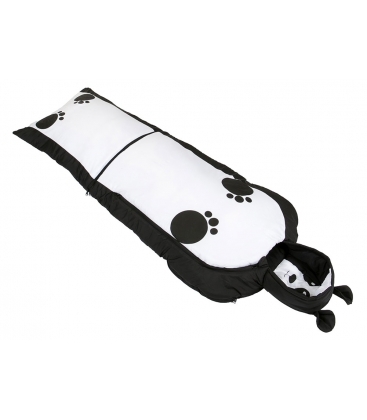 It has a 9 Tog rating and is suitable for children up to 150cm tall. 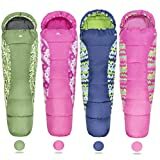 What I particularly like about these sleeping bags for children is that these can be carried as a rucksack so that you can get the kids to help carry their own stuff. 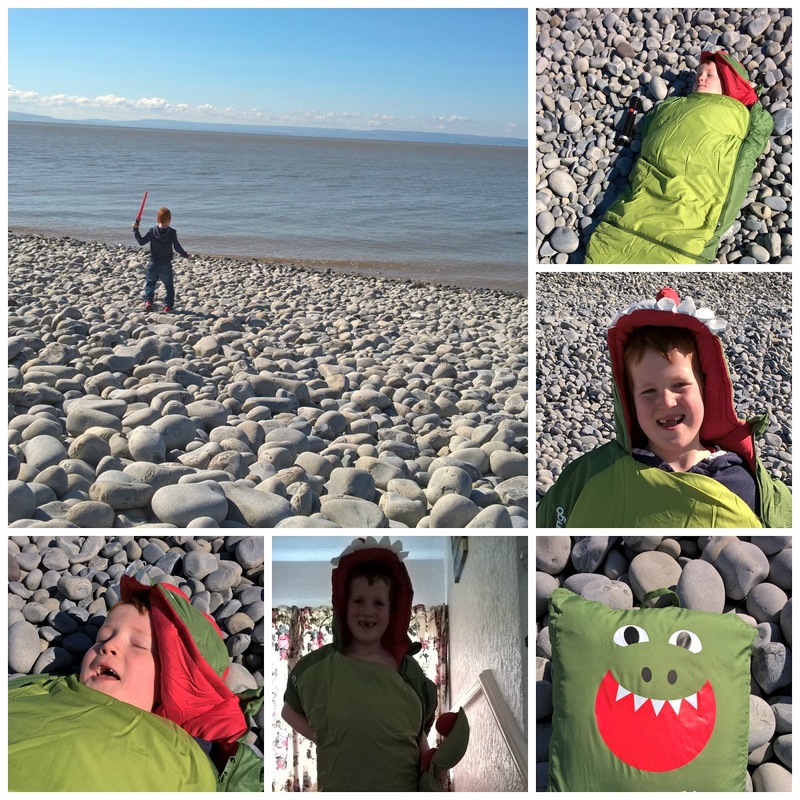 We got Ieuan to test it out for us on terrain which would make Bear Grylls proud (the beach at The Knap, Barry) and once into it, we had difficulty persuading him to take it off. You can see from the photos that he was still wearing it at tea time and he is currently campaigning to take it bed with him. It has some lovely little design touches, such as a dragon’s tail and a dragon’s face on the rucksack. We found the sleeping bag to be well made with sturdy zips and stitching. The removable bottom section will be a great help on those occasions when there are frequent toilet trips and your child could certainly wear it on chilly evenings – perhaps for a bit of star-gazing. We will certainly be taking it with us on our next camping trip. 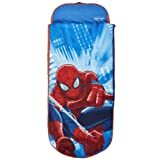 If you are looking for sleeping bags for children, the Vango Starwalker Junior Sleeping Bag retails at around £34 and is available from www.amazon.co.uk. "My Sunday Photo – 24/04/2016"